Join the Branford Land Trust for its Annual Meeting on Wednesday, May 28, 7:00 p.m. at the Blackstone Memorial Library. 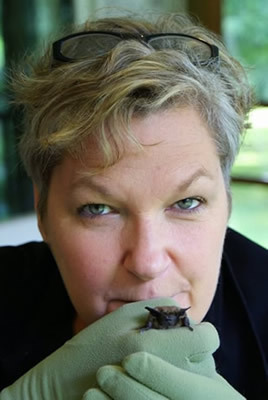 Gerri Griswold, The Bat Lady, along with Karen Hannon of the Branford River Raptor Center, will present “Bats: Earth’s Allies,” an in-depth journey into the fascinating world of bats. Learn about where they live, their natural history, the problems they face, what they do for you and our planet, and most of all what YOU can do for them! Gerri Griswold is Director of Administration and Development at The White Memorial Conservation Center in Litchfield, Connecticut. She has handled bats for 21 years as a wildlife rehabilitator and educator, and is licensed by the Connecticut Department of Energy and Environmental Protection and the United States Department of Agriculture to keep and exhibit non-releasable bats and, more recently, porcupines, for education. Over the years Griswold and her bats have delivered hundreds of programs to libraries, classrooms, Scout troops and organizations like the National Park Service and the Yale Peabody Museum. A short business meeting will take place before the lecture. Refreshments will be served. The event is free, and all are welcome to attend. For more information, call (203) 483-5263, follow our Facebook page, or sign up to receive regular email notices of upcoming events.